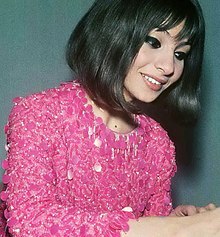 Esther Zaied, better known by her married name Esther Ofarim (Hebrew: אסתר עופרים‎; born June 13, 1941), is an Israeli singer. She came second in the Eurovision Song Contest 1963 with the song "T'en vas pas", representing Switzerland. 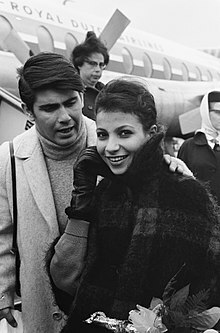 After marrying Abi Ofarim (born Abraham Reichstadt) in 1958 and for a full decade in the 1960s, she was half of the singing husband and wife duo, Esther & Abi Ofarim. After they divorced, the duo broke up and she undertook a successful solo career. Esther Zaied was born in Safed to a Syrian Jewish family. She began performing as a child, singing Hebrew and international folk songs. In 1958, she met Abi Ofarim, a guitarist and dancer, whom she later married (11 Dec 1958). Esther landed a small role in the film Exodus (1960). In 1961 she won the Song Festival in Tel Aviv, where she sang "Saëni Imchá Bemachol" (Take Me with You When You Dance) and "Naamah". Two years later, she took part in the 1963 Eurovision Song Contest representing Switzerland with the song "T'en vas pas". In a very close and controversial competition with Danish winner duo Grethe and Jørgen Ingmann, her song placed second. Initially, it appeared Switzerland had won the contest with 42 points to Denmark's 40, but after a change to the Norwegian scores, Ofarim earned 40 points with her song "T'en vas pas" against 42 points to the eventual winning song "Dansevise", reversing the initial result. From then on, her duo with Abi Ofarim took off. In 1966, they had their first hit in Germany with "Noch einen Tanz", an English version of which, "One More Dance", was a hit in the UK two years later, peaking at no. 13. Their greatest success in Germany was in 1967 with "Morning of My Life", which was written by the Bee Gees. In 1968 "Cinderella Rockefella" hit the top of the charts in a number of countries including the UK. They played many live concerts in New York City and London, and in 1969 they toured around the world. The couple divorced in Germany in 1970. Esther began her solo career with several albums and concerts. On 25 February 1970, Ofarim co-starred in her own BBC Television 'Special' The Young Generation Meet Esther Ofarim broadcast on BBC1. In 1984, she played in Joshua Sobol's play Ghetto, produced by Peter Zadek in Berlin. There she sang songs including "Frühling" and "Unter deinen weissen Sternen". Ofarim's songs were featured in the 2004 Israeli film, Walk on Water. 1963: "Morgen ist alles vorüber"
1965: "Bye Biddy - Bye Bye Jack"
1966: "Die Wahrheit (die Fahrt ins Heu)"
^ Achterfeld, Wilfried (February 16, 1966). "Die Ofarims" [The Ofarims]. Stern magazine 16 Feb 1966 (in German). ^ "One More Dance". Officialcharts.com. Retrieved June 7, 2015. ^ Roberts, David (2006). British Hit Singles & Albums (19th ed.). London: Guinness World Records Limited. p. 404. ISBN 1-904994-10-5. ^ "BILD 9.5.1969 - Esther and Abi Ofarim split - Esther trennt sich von Abi:sie singt nur noch allein". www.esther-ofarim.de. Retrieved September 10, 2016. ^ "The Young Generation meet Esther Ofarim - BBC One London - 25 February 1970 - BBC Genome". genome.ch.bbc.co.uk. Retrieved September 10, 2016. This page was last edited on 29 March 2019, at 09:43 (UTC).